This is my first ever blog swap and I am so excited. Here's Courtney from Scraps and Scribbles! Hey all you 504 Main readers! I'm happy to be visiting with you all today! I'm such a huge fan on Holly-she is amazing and ditto about her blog! In case you're wondering who this girl is, I'm Courtney from Scraps and Scribbles. That's me with my wonderful little family. I've been married to my wonderful husband for just over 5 years. We have one 2-year-oldlittle boy, who I have the wonderful privilege of staying home with, and one bun in the oven : ) We live in sunny Florida, and love it. When I'm not spending time with my son or taking care of my responsibilities as a housewife, things like cleaning and the laundry, I like to craft, sew, cook/bake and take pictures. I'm a big fan of DIY decor and ways to dress up my home on the cheap. I'm also the creative mind behind D Squared Creations, my Etsy shop that I run with my sister-in-law where we sell our pretty creations. It's full of fun vintage finds and pretty jewelery to dress up your outfits. I love fashion and make-up and sharing what I find. If you'd like to know more about me,you can check out the About Me page over at my blog. I love finding inexpensive ways to dress up my home. This photo collage star is one of my favorite projects. I get compliments on it often when we have guests. I love photography. I fell in love as a child and that love grew in high school through an awesome photo class (and equally awesome teacher) and have been a shutterbug ever since. I have a little photography business that allows me to work when I want and still be able to be home with my son. I started by doing a wedding as a gift to a friend 7 years ago and it has just grown from there. I do everything from cute babies to families to engagements. 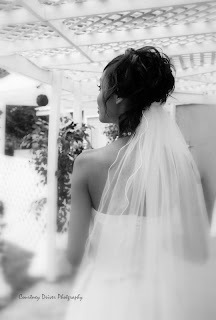 This is my gorg friend Hallie-I had the honor of photographing her wedding almost four years ago. One of my goals when I started my blog was to become better at sewing. My Anthro-inspired ruffle tee was one of my very first endeavors and I loved it! I love baking and sharing yummy recipes. These surprise cupcakes have been a favorite of mine since I was a little girl! I do a weekly segment where I share tips and tricks. One of my favorite series was the one I did on make-up (one of my passions)-you can check out my video tutorial on how to do up your whole face in 10 minutes. Thanks so much for letting me come by today and share a bit of me and my blog with your lovely readers, Holly! I hope you all come by Scraps and Scribbles and say hi-I'd love to meet you! Courtney, thanks so much for swapping with me today! Everyone go say hi and check out the amazing Scraps and Scribbles! Courtney, It's so wonderful to meet you. You are one talented lady! Your photography looks amazing and dang if I don't want one of those surprise cupcakes. I'll have to stop over and check out your post on makeup. I tend to not wear much because I don't like to take the time to put it on. 10 minutes is totally doable though. How fun! I'm going to head over and check out your blog! Always a pleasure to meet another creative spirit! Thanks for introducing us to Courtney, Holly! I'm looking forward to seeing more of that photo collage star! Wow Courtney you are very talented in many different areas!! It was nice meeting you. Now I am going to check out your blog and see Holly's post!! It sounds like an amazing blog. I will definitely be visiting.